A WW1 medal group to 113028, Corporal (later 2nd Lieutenant), Francis Reginald White, who served with 33 Section, 189 Company, (Special Companies) Royal Engineers as a ‘Chemist Corporal’, before being later assigned to the RFC, (10 Squadron), to act as an observer for the Special Companies to undertake reconnaissance before and after Allied ‘gas attacks’ on the Western Front. He was killed as a result of injuries sustained during a mid-air collision on the 22nd January 1917, dying a day later on the 23rd. His Commonwealth War Graves Entry can be viewed by clicking on here. 1914-15 Star named to 113028, CPL. 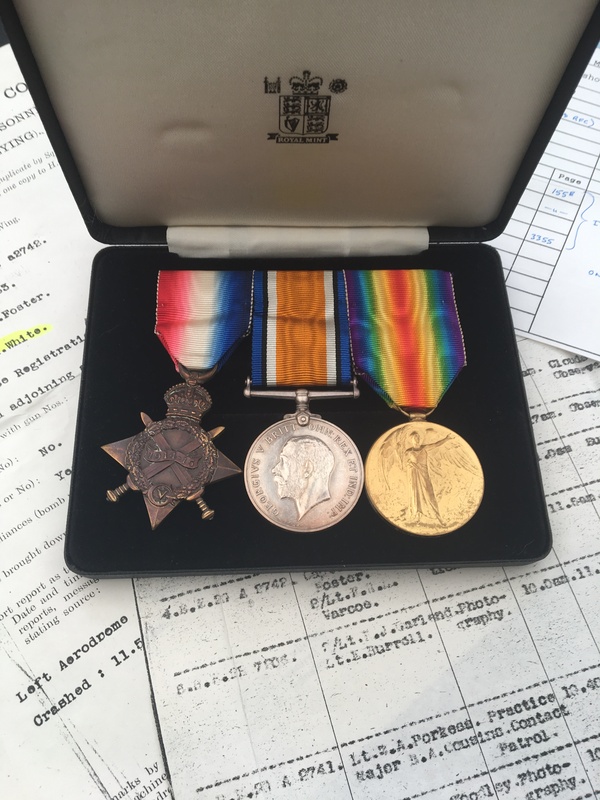 F. R WHITE, R. E.
British War Medal and Victory Medal named to 2. LIEUT F. R. WHITE. The medals are swing mounted with their original ribbons and come in a presentation box. Unfortunately the Memorial Plaque is missing. 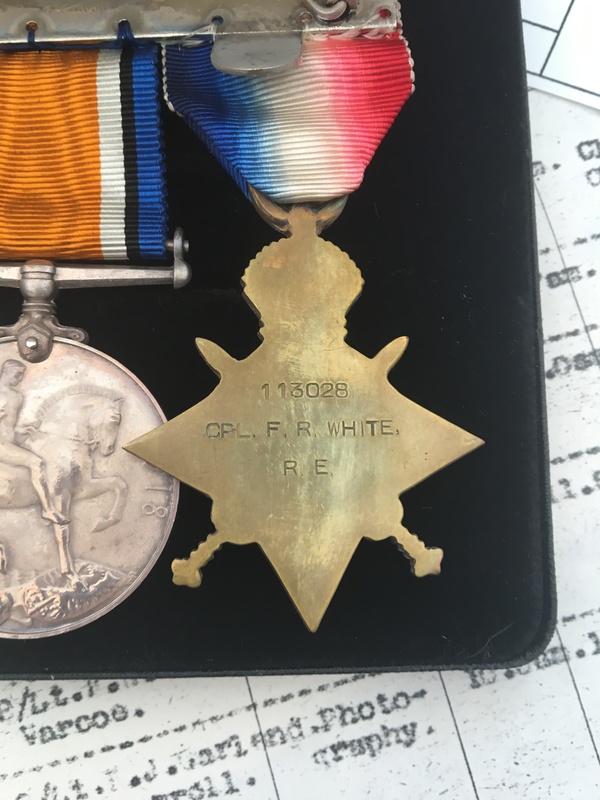 The listing comes with a complete (electronic) copy of his service records which confirm that he was assigned to 33 Section, 189 Company, (Special Companies), Royal Engineers, before being assigned to the RFC. 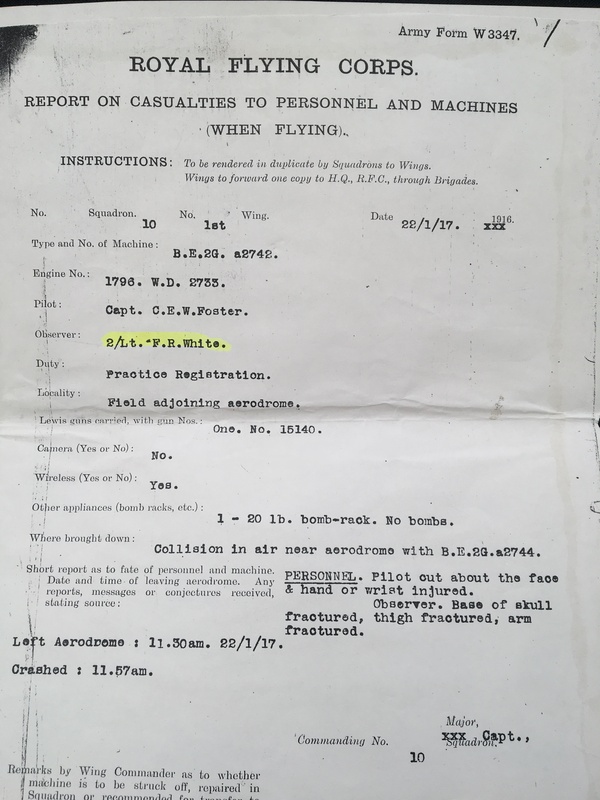 Also included are paper copies of the official RFC casualty report and other documents relating to the mid-air collision that resulted in his death. White, was born June 1893, and prior to the war lived and worked as a schoolmaster in Chatham, giving his address as ‘Woodstock’ Rainham Road, Chatham, Kent. 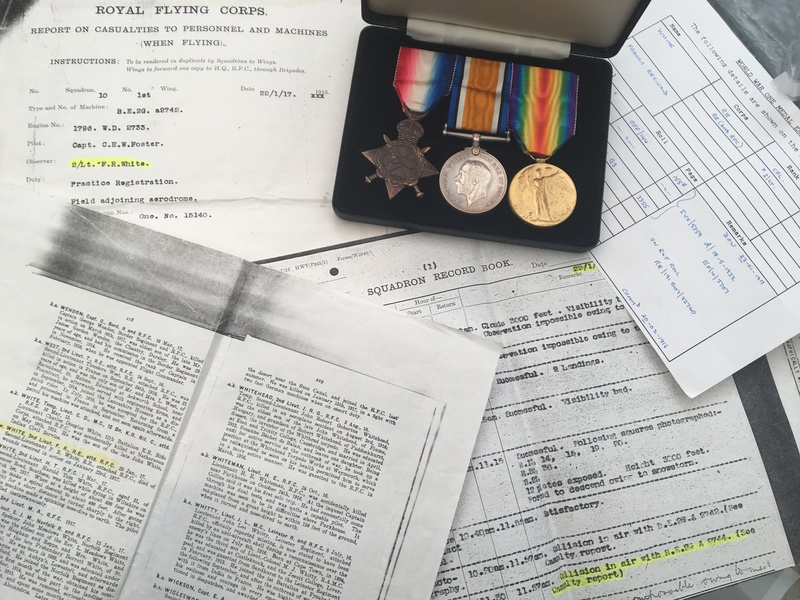 According to his service records, he enlisted into the Royal Engineers (‘Chemist Section’) on the 13th August 1915. Upon enlistment he was immediately ‘promoted’ to ‘Chemist Corporal’. According to his Medal Index Card, which can be viewed clicking on here (if you have access to Ancestry, although a paper copy will be provided), White arrived in France on the 31st August 1915 and again, according to his service records, on the 3rd September 1915, he was assigned to 33 Section, 189 Company, Special Companies, RE. The date matches that of both the 188 and 189 Company (Special Companies) RE deployment to the Western Front – SEE NOTES BELOW regarding the Allied use of Poison Gas on the Western Front. In January 1916, White was commissioned from the ranks, his London Gazette entry confirming this can be viewed by clicking on here. Following officer training he was appointed back to the ‘Special Brigade’ and assigned to 10 Squadron RFC to act as an observer. On the 22rd January 1917, White was undertaking a ‘Practice Registration Mission’ in a BE2G and it appears that his aircraft collided with a similar plane over the field adjacent to the Aerodrome at Chocques (in northern France close to Bethune). Both White and the pilot were injured, White sustained a Skull, thigh and arm fracture and he died from these injuries the following day. His service records include correspondence to and from his next of kin in regards to the accident, and his subsequent death. The history of 10 Squadron can be viewed by clicking on here, while further details regarding the aircraft he was in at the time of the accident can be viewed by clicking on here and by clicking on here. THE USE OF POSION GAS ON THE WESTERN FRONT (details taken from the ‘Long Long Trail’): As early as 3 May 1915 the British Secretary of State for War, Lord Kitchener, authorised the preparation of measures to retaliate against the German use of poison gas. Experimental research work was carried out at Porton, and a laboratory established at Helfaut, near St Omer in France. The Kestner-Kellner Alkali Company, being the only firm in Britain capable of manufacturing Chlorine gases in quantity, supervised trials with the final large-scale one taking place at Runcorn on 4 June. The method - as used by the Germans - was to form a continous cloud by discharging compressed gas from cylinders to the atmosphere, and allowing the wind to move it over the enemy positions. PRICE £1495 - please read the terms and conditions below.